Here she talks with Ray about her varied career and the reasons she's ended up challenging conventional wisdom. She also talks about her research into the pros and cons of breast cancer screening and questions the widely-accepted idea that early detection is always the best medicine. Ray: Hello, and welcome to The Recommended Dose, the podcast that promotes a more questioning approach to healthcare, presented by me, Ray Moynihan, produced and funded by Cochrane Australia and co-published by the BMJ. Today, a conversation with Professor Alex Barratt. Alexandra: I find that unacceptable that we cover up things that the public deserves to know. Ray: Based at the University of Sydney in Australia, Alex Barratt is known globally for promoting the importance of using scientific evidence in healthcare and the need to inform people about that evidence. One of the things she thinks the public deserves to know more about is the danger of being diagnosed unnecessarily, if you have a screening test for the early signs of disease. And you may be surprised to hear what she has to say about the pros and cons of screening for breast cancer. Alexandra: I know women who've decided that for them, it's worth it, and they want to be screened, and I know women who, having become very well-informed, don't want to have anything to do with that and make very well-informed decisions not to be screened. Ray: So passionate is Alex about informing people, she's led something of a double life, moving between medicine and the media. So to kick off, I asked her to explain just how she first came to journalism soon after finishing her medical degree. O and a small apology first, the sound quality on this episode is not quite up to our usual standard for this podcast. But now back to Alex Barratt, and how she first came to journalism. Alexandra: Well, I came to it because I really struggled with clinical medicine. I found it exhausting and a little bit soul-destroying. I felt like it's right at the end of the process, and there are so many things that determined people's health other than the healthcare system. It was almost those other things. The conditions in which we're born and live that have interested me, so I always was torn between medicine, which I found fascinating but also all the social aspects of our lives. After I did my internship, I wasn't really happy with clinical medicine, and long story short, I talked my way into a cadetship at one of the large newspapers here, and I did my cadetship with them. Then, from time to time, I've worked in other print media and also in radio. I really fell in love with radio. I thought radio was just such a fantastically interesting and intimate media. You can really talk one-on-one with people, and it gives you such an opportunity to engage with a much bigger audience. Ray: Well, we'll talk a bit about your radio productions quite soon because they were very powerful. They had quite an influence on me and many people, I think, but first of all, why didn't you ... You did a cadetship at a major newspaper in Australia. People would kill for such an opportunity, but then, you walked away from it, and walked presumably back into medicine, back into an academic career, an early academic career. Tell me, why did you do that? Alexandra: Well, I did, and it wasn't a well-thought through decision at the time. I was really annoyed with the newspaper where I was working because the health reporter round came up, and I'd done lots of other things. I'd done education and general news, real estate and television, and health round came up, and I really thought, "I could do that and do it well," but to my annoyance, they gave the job to somebody else who I thought was much less qualified. It just so happened that at that time, somebody offered me a job at the university, and so I took it. I worked there, and as I was working there, I thought, "Well, I'm here. I might as well learn something." I enrolled in the Masters of Public Health, and I had the great good fortune of having my lectures in epidemiology by Professor Les Irwig. They were just mind-opening lectures that gave me the skills to ask questions, which perhaps I had always wanted to do as a journalist, but I'd never really had a formal training in how do you think in a strategic way about, what are the questions that you want to ask? What I learnt from Les gave me those skills, so then, I fell in love with epidemiology, and that's been something that has sustained me now for the best part of 25 years. Ray: What is it? I mean, try and explain to us mere mortals who haven't studied epidemiology, what is it about? What was it about those lectures from Les Irwig that changed your life? What is it about epidemiology that's so significant and important? Alexandra: I think it was the first time in my education that I had been taught to think. Oh, that's a really ... That's quite an indictment, isn't it, because by then, I had finished my medical degree. And obviously, I've learnt a lot. But medicine, at least in those days, was very much about rote learning. There was an enormous amount of anatomy and physiology and pharmacology and pathology that you had to learn. What I learnt in epidemiology was to think. For the first time, there was a structured approach about how to think critically and ask questions that would enable you to not just accept things that you had been told but actually inquire into them and look for the evidence behind what you were being taught. I was actually appalled to discover that a lot of the things I had learnt as a medical student in fact turned out to be wrong. I know I'm not alone, and I know I've talked to other people over the years. People like Iain Chalmers and Gordon Guyatt who went through similar experiences of working and treating patients and then discovering that actually, the things that they were doing, in fact, were harming people, when they had believed that they were helping people. Those things range from public health interventions like giving mums advice about how to put their babies to sleep. So at the time that we're talking about, we were told that you should sleep babies on their tummies. I think it was an advice from Dr Spock because that way, if they baby vomited in the night, they would be less likely to regurgitate or inhale food. It was part of the effort to try to reduce the risk of death from sudden infant death syndrome. It turned out, and it wasn't until decades later that some observational epidemiology was done that demonstrated that in fact, it was much safer to put babies to sleep on their backs. That was a really shocking thing, to find out that the advice that we have been giving people with the best of intentions was actually putting them at risk of harm. I could go on. I won't go on, but I could go on and on and on about examples like that where we think, we thought as doctors, with the best of intentions, we were doing good things for people. We're actually harming them. Ray: It's a theme of this podcast, and it's certainly the theme of this whole kind of movement towards an evidence-based approach in healthcare. We'll talk a little bit more about that later, but back to you being a sometimes journalist, sometimes academic, do you have a sense that, that has helped you become a better communicator as an academic? I mean do you see it as problematic, the way in which many scientists and academic researchers find it quite difficult to speak in language that people understand? Is that a problem in your mind? Alexandra: I think it's a shared responsibility, isn't it? Science is hard. Basically, it's painstaking. It's detailed. It's technical, and we need people who are really good at those things, so that they can come up with the best science, whether that's their aeronautical science or electronic or medical. We really need those people, and I feel it's not entirely reasonable to expect those people to also be able to have the sort of communication skills that you're talking about. I think some do. Some scientists do, and I was very influenced early in my life by Carl Sagan. I don't know whether anybody else remembers Carl Sagan, but he was a really talented science writer and communicator. I think people like that are just a gift to the world because they do make science so accessible to a general audience, but I think when it comes to understanding science, we've all got a responsibility, whether we're patients or doctors or policy-makers or citizens to try to at least follow, at least understand and put in some effort so that we can meet halfway. Maybe not the conventional wisdom at the moment, but I think that job of communicating evidence of science from the technical specialists to the audience that needs it is a skill and is not something that we should necessarily expect all scientists to be able to do. Ray: Am I right in thinking too that in some ways, it would be nice to think about that communication more as a conversation, rather than this deep wisdom being imparted to the great unwashed? Perhaps there is great value in having much more of a two-way conversation between science or the academy, the research world and civil society, which after all is one of the biggest funders of all the work that we do as academics. Alexandra: Absolutely. I think that's absolutely right, and we do, as scientists, have a responsibility to the community that funds us, to make that information accessible. But I think it's perhaps not reasonable to expect that every single scientist should be able to do it, but there certainly should be a process for doing it. For example, one of the things ... Well, I've been lucky in my life. I've been able to be involved in two changes, two big changes to the culture of healthcare over the years. The first was evidence-based medicine, and the second was shared decision-making. I think that exemplifies the issues that we need our doctors to have the best available evidence. We need them to be able to understand it and to critically appraise it and to apply it. But as patients, what we think and want and feel, what matters to us is really important too. So it's about being able to do that in partnership where the doctor brings that expertise. The patient brings what they're expert in, which is what matters to them, their own values and preferences and being able to make a decision together. I personally think that, that's the best way to practice medicine. I had a recent experience that really exemplified this because my daughter was very unwell, and we urgently needed the help of a surgeon, and I was just so delighted with the surgeon that helped us because he exemplified, he personified those skills. He understood the evidence. He had trained not only in surgery but in clinical epidemiology, and he really understood how to access the evidence that we would need and how to apply it to her, but he was also so humane. He was able to talk to not only her but to the whole family and to really care for us all and to provide all those things that we'd hoped that doctors will provide in addition to their technical expertise. The compassion, the trust, the support. It was really a delight to encounter him. Ray: Take me back briefly to the beginning of the evidence-based medicine movement, because in a sense, it's still quite young. I mean it's only 20, 25 years ago. I think you were, in some ways, at the forefront of that together with colleagues around the world, but at the time, it certainly wasn't immediately accepted, was it? There was certainly some pushback and some resistance. Alexandra: It was definitely not immediately accepted. It was really very contested. I remember going to talk after talk after talk with doctors, with the public and just being hammered. A friend of mine used to say, "Oh, well, we’ll go and get bashed up again," and we did because people hated that idea of evidence-based medicine. It really rubbed people up the wrong way. I've had the great privilege of knowing Gordon Guyatt who was actually the man who came up with the term, evidence-based medicine, and I talked to him about this one night because I find it difficult to understand why people should be so opposed to it. He said, "Well, you know Alex, if you challenge people and you tell them the way they've been doing something is wrong could be better... It's human nature not to like to be told that." And he told me that the choice of the label, evidence-based medicine, how funny we should talk about labels, the label of evidence-based medicine was made very, very deliberately to be provocative because it was designed to get people to reflect on those things like the advice that Dr Spock had given and lots of other advice that turned out to be harmful and to recognize that actually, we could do it better. We could get better evidence, and we could make better decisions, but it was certainly really challenging in those early days. Actually, one of my first jobs was to make the evidence-based medicine curriculum for the new medical program at the university where I was employed. It was one of the first universities in Australia to provide a course in evidence-based medicine, which was really the foresight of Les Irwig. We really had to fight to get that into the curriculum. It's hard to believe now because evidence-based medicine has become so embraced and so accepted, but at the time, it was exceptionally difficult. We worked and worked, and worked to be able to have space in the curriculum to teach it and for our colleagues to be able to feel comfortable with letting us teach it and not to feel threatened or defensive or that their clinical care was being undermined - which was never ever the intention, but obviously we just wanted to improve the standard of the care that was being offered. Ray: You're listening to The Recommended Dose today with one of my colleagues and mentors, Professor Alex Barratt from the University of Sydney. If you're still wondering what epidemiology is, don't worry. You're not alone. A lot of us continue to wonder. Perhaps a little easier to explain is a new approach in healthcare gaining a lot of attention now around the world called shared decision-making. Alexandra: Well, I think it means literally what it says. It means that we make our decisions together, so it's not the paternalistic model where the doctor has all of the information and all the power who makes all the decisions. It's not a super-informed patient who does it all on their own either. There can be people who choose to do things that way, obviously, and I fully respect their right to do that, but I think there are times when you actually need the guidance of a doctor like the episode that I referred to, and it's great. You know, the ideal is, if you've got a doctor that you can really share decisions with so that you don't have to do all of the evidence work yourself. You can actually talk that over with the doctor, but what, as a patient, you bring to it is your personal values and preferences. Nobody other than you can do that. I think that's so important. It's not one or the other. It's not science or instinct. It's evidence and personal preferences, and that's really, to me, the heart of shared decision-making. There are lots of ways that you can do it. In the group where I've worked, we've made and evaluated lots of decision aids, which provide the evidence to people so that they can consider it in their own context and consider what aspects of it matter to them, what other things matter to them and with their doctor, come to a decision. It doesn't need to be complicated. It can be complicated. We've certainly made some very long complicated decision, decision aids, but I also remember a research project that I did with a wonderful health consumer who, after a very distressing interaction with the healthcare system herself was determined to try to improve things. I remember her saying to me, "I'm so sick of saying to doctors, 'Please, please, please use the evidence.'" She said, "I want to do something to really, to make doctors use evidence," and so she designed these three questions to ask, for patients to ask to doctors. The questions were, "What are my options? What are the benefits and risks of each of the options? What are the chances of each of those benefits and risks for me?" She believed that if patients asked those questions, they would get the evidence that they need in order to make better decisions, and that they would be able to do it in a way that was consistent with what mattered to them most, make decisions that were concordant with the way they wanted to live their lives. I remember interviewing her for a radio program, actually, that I was doing for the health report, and one of the listeners, bless this listener, sent me an email to say, "Well, Alex. You're always telling us about the importance of randomised control trials. Now, you're telling us about this intervention, these questions, but do you have a randomised trial that shows that they work?" I thought that was such a good question, so I worked with her, Karen Carey, and we applied for funding with a group of other people. Eventually, years later, we've managed to actually get research funding, and we tested those questions. It was one of the most interesting research studies I think I've ever done because we did a study that involved secret shoppers. We had these actors. We trained actors to ask those questions, and we trained ... Each actor worked in pairs. One of the pair, they shared a character, and one other pair asked the questions about the condition that they were presenting with. The other one in the pair of actors could ask other questions but not those questions. Then, we sent those actors around to doctors, to general practitioners to visit them, and we wired them, so they carried hidden tape recorders in their handbags. They went around, and they interviewed. I mean they had these consultations, and we audio recorded them. Then, we analysed the recordings. And we were able to show that, in fact, asking those questions did make a difference. It improved the amount and the quality of the evidence that was brought to the table by the doctors. So the doctors knew it. They had the evidence available. They were just not routinely sharing it. The questions triggered that evidence to be put onto the table, if you will. Also, it increased the level of involvement of the patients in the decisions. So it shifted the consultations more towards shared decision-making. We've published that study, so I think for me, that's really what shared decision-making is aiming for. Ray: Amazing study. My immediate question is how on earth did that ever pass through an ethics committee? Alexandra: It's an excellent question, Ray (laughs). An excellent question, and the way we did it was, it was a remarkable study. The way we did it was, the doctors were absolute gems, so they knew that they were participating in a study of patient-doctor communication, but we kept the study hypothesis from them. They knew that they would be visited by two standardised patients over the course of six months, but they didn't know when they were coming or what the consultations would be about. So they did consent. They just didn't know exactly when, which patients would be doing this. We did some pilot testing with a colleague who's a GP, and she was so funny about it because she said to us afterwards, "I think you sent me a standardised patient yesterday. Did you? Did you send me one?" She said, "I thought it was, but then, I realised that I couldn't ask the patient because obviously, if they weren't one, then that would be really embarrassing and inappropriate, so I just had to do the consultation as normal anyway." We thought, "Well, there you go. Bingo. We've got a design that works." My heartfelt thanks to the doctors who participated in that study. Ray: As you were talking, Alex, I was just thinking, these are both, in many ways, very positive developments. This whole emphasis on evidence in the last 20 years, this move now to try and move away from paternalism towards more shared decision-making. These are very positive things, but it's important, is it not, to acknowledge that the reality out there is often very different from both of those things? I mean we could both point to, and I'm sure many listeners could point to examples where they've been confronted with an incredibly old-fashioned paternalistic attitude in recent times, and indeed, there are many situations where you still have crude commercial forces driving decision-making rather than good evidence. I just wanted to add that caveat. Is that fair? 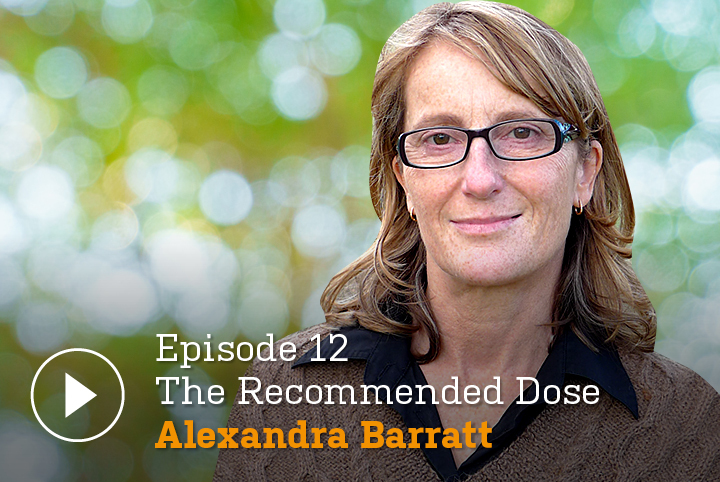 Ray: Alex Barratt's journey through evidence-based medicine and then to shared decision-making has ultimately led her to cast more scientific scrutiny on healthcare that targets the healthy like the big screening programs such as mammography for breast cancer. It's led her to start questioning that widely-accepted idea that early detection is always the best medicine. Alexandra: Trouble with early detection is, it's so intuitively appealing. It just seems like a no-brainer. It seems like a no-brainer. It seems like you couldn't possibly go wrong. Of course, it would be a good idea to find disease early when you can intervene and do something before it causes trouble, but the problem is that by doing so, you actually not only tell people that they've got a condition, but you actually expose them to treatments which might carry risks. You really need to be sure that the benefits are going to outweigh any harms that might come from that early detection process. Ray: It's important to note at this point that Alex Barratt was, at one time, a manager of a screening program for cervical cancer. And she's had a strong awareness of the benefits of screening, but the closer she's looked at the evidence, the more she started to uncover the potential harms of screening, chiefly that people could end up being diagnosed unnecessarily. And not content to simply publish scientific articles. She's also made a series of award-winning radio programs. Alexandra: I was astounded by this because I didn't expect to find it. I went into my exploration of breast cancer screening expecting that this would be a good thing, that this would work, that it would reduce the risk of dying for women, and I was alarmed to find that the evidence suggested that by detecting breast cancer early, you could in fact find biologically inconsequential breast cancers that would not be destined to cause any problems in women's lives, if that had been left undetected and untreated. The problem with that, of course, is it's a very alarming thing for a woman to be told she's got breast cancer. It's a psychologically enormous burden for the woman but also for her family, for her partner, for her children, for her siblings, for her parents, so we can't take that on lightly. Of course, there are other physical risks of having breast cancer treatments. Obviously, you would want those treatments if you have a breast cancer that is destined to be progressive but not for a breast cancer that is never going to harm you. As I became more and more and more aware of this, I realized that although there were many epidemiologists that were aware of this problem, we were not being able to get that message out. We were really not being able to convey that to policy-makers or to the people involved in screening programs. I thought that I would try to do something about that by making a series of programs that would be really accessible to the public that would cover the big cancers that we screen for. We'd look at prostate cancer screening, breast cancer screening, cervical cancer screening and bowel cancer screening and talk about their benefits but also the risks in an accessible way. That was the aim of that series. It went to air, I think, in 2005, and it ended up winning a Eureka prize. I guess it was one of the many things that I've done over the years to try to develop the evidence-based and to bring that information forward so that doctors and policy-makers and the general public would be more aware of the downsides of cancer screening. Ray: Just to update this a little bit, I think I'm right in saying that by 2014, a big British inquiry, very, very high-powered, utterly reputable inquiry into breast cancer screening looked at all the evidence, concluded that there was a lot of uncertainty, but perhaps one in five of the breast cancers picked up through breast cancer screening and treated would never have caused those women any harm. Is that right? Alexandra: That's right. It was actually an independent committee that was asked to do the work. It was triggered by a parliamentary inquiry. It comprised of people who had never been involved in breast cancer screening, so they were very eminent professionals, but they had no stakes or they avoided any conflict of interest in breast cancer screening. They looked at the evidence very objectively. They were led by Sir Michael Marmot and they came to the conclusion that you just outlined that while there's a benefit, there are risks. The key risk is the risk of overdiagnosis and as you say that, they estimated that, that would account for about one in five of the breast cancers being diagnosed currently. We've done singular work in Australia and come to very similar numbers. There's been studies now all around the world that have come to a similar point of view. It's very, very contested space, still, because I think finally now, overdiagnosis of breast cancer is widely accepted, but there is still a lot of argument about how commonly it occurs, whether it's less common than that like perhaps only accounting for 5 or 10% of the breast cancers that are detected or perhaps they're counting for even more. Maybe up to 50% of screening-detected breast cancers. There's still a lot of uncertainty about how commonly it happens. At the same time, there's also a lot of uncertainty about how effective it is in reducing the risk of dying from breast cancer, how effective mammography screening is. That's because the trials that were done for mammography screening, and now decades old that were started in the '60s, '70s and '80s. We've got only one relatively recent trial, which started in the 1990s, but most of the evidence is very old. Meantime, the treatment for breast cancer has improved so much that perhaps that benefit of screening that existed that the trials demonstrated back in the '70s and '80s, perhaps that's no longer relevant because we're so much better equipped to treat breast cancer now. So it's still, I think, a very uncertain space. That makes it extremely difficult. It makes it difficult for women to know whether to participate in screening. I certainly know women who've talked to me at length about it and have come to both views that I know women who've decided that for them, it's worth it and they want to be screened. I know women who, having become very well-informed, don't want to have anything to do with that and make very well-informed decisions not to be screened, so it's still, I think, a very, very contested and difficult space. The most recent thing that happened was another independent inquiry, which was just conducted last year France, again, by a committee of people with no connections at all to breast cancer screening. They did a very extensive review of both the evidence. And they also did the civil inquiry where they consulted with the public in-depth about what women wanted and expected from breast cancer screening and came to the conclusion that the breast cancer screening program in France needed to either be stopped and ended in its current form or radically reformed. They're in the process of making radical reforms to the screening program in France at the moment. Ray: Wow. This is an extraordinary topic. It is, as you say, highly controversial. There will be many people listening who will be, I think, very shocked by what you say, and I think, certainly the cancer establishment around the world is still, I think, very strongly of the view of the benefits of breast cancer screening. At the same time, I think they're becoming more open to having to deal with this downside of overdiagnosis. It isn't part of the problem with this discussion about overdiagnosis and breast cancer, for example, that at this stage, it's almost impossible to tell when you detect what we might call an early cancer, whether or not it's going to go on to cause harm or not. Doesn't that complexity make this argument even more difficult and communicating this problem even more difficult? Alexandra: It does, indeed, make it incredibly difficult because at the moment, we have no way of knowing which breast cancers are going to progress and which ones won't. It's a bit like a lightning strike. We can say with absolute certainty that there will be a lightning strike. We cannot say where the lightning strike will be, and it's the same sort of thing. We can look at the data, and we can say, "There is much more detection of breast cancer than can be explained by a biologically consequential breast cancer," but we cannot say which individual women have got biologically consequential, and which women have got biologically inconsequential breast cancer. That is the conundrum that is at the heart of overdiagnosis. That is exactly what makes it so incredibly difficult. So what to do about it? Ray: Is there a danger in us talking about overdiagnosis in the work that you and I both do any many others now do on overdiagnosis? Is there a danger that we're just creating more unnecessary fear, creating more unnecessary confusion? Alexandra: A question that I've struggled with a lot. I am reminded of a woman who's also become a consumer advocate who had her breast cancer diagnosed because she went to screen, and her take on it was, she got an invitation to go to have a breast screen, and she went thinking it was a bit like going to see the dentist. She didn't expect anything to happen, and one thing led to another, and she was recalled. Then, they said they'd found something. They did a biopsy, and she was diagnosed with breast cancer. She had surgery. She had radiotherapy. She has been put on hormone treatment for some years, which has had quite a lot of side effects. For example, now, she has osteoporosis, so she's been told she needs to be really careful about going outside in winter because it's icy where she lives. If she falls, she might fracture something. She was a very inquisitive person. After she was diagnosed with breast cancer, she started reading about it. She discovered by herself the possibility of overdiagnosis of breast cancer. The more she read, the more horrified she became. Not that this could happen. I think she accepted that, but that nobody had told her about it. She said that she had, when she was younger, had a baby late in life and she had had prenatal screening. At that time, in order to access the screening, she'd gone through a complicated process of talking to people and having it explained to her what the risks were, so that she would be prepared if that were to happen, and so that she could make a fully-informed decision about whether she wanted to go ahead with that prenatal screening. She couldn't believe that something that could impact her life as much as a breast cancer diagnosis and treatment could happen to her as a result of a letter that sounded like just going along for a dental check-up. She couldn't believe that people hadn't provided her with the information, so she could have made the decision upfront about whether she wanted to take those risks or not. Because some women when they read, "There's a one-in-five chance that you could get a breast cancer over-diagnosed," will think, "Well actually, I don't have any symptoms," comes back to what I was saying before. "The screening program's not for well people. I don't have any symptoms. I feel well. There's nothing wrong with me. If I develop a breast lump, then of course, I will investigate it and get it treated, but while I'm well and I don't have any lumps, there's nothing wrong with me. I don't want to have a mammogram that might find something early that we'll never know for sure whether it was going to hurt me or not." And that's her problem, is that she's left with this uncertainty. She's left with the anger that she wasn't informed. She's left with the uncertainty. She'll never know whether she was overdiagnosed or not. I think that's the risk of not talking about it, is that there will be people who will find out about it later. And those people will feel betrayed and let down and disillusioned that we didn't talk about it. Ray: Just to wind up, I mean in a sense, I think there's a theme running through a lot of your work where you are challenging conventional wisdom. I think that's true with the evidence-based work. I think it's probably true with shared decision-making, and it's certainly true with your work on overdiagnosis. There's a certain courage there. I mean where does that come from? Is it hard to be constantly challenging conventional wisdom? Alexandra: I think it comes back to where we started this, Ray, with my dual life as a journalist because that's what journalists do, is they ask questions. They want to investigate. In an ideal world, we have reporters that want to seek out the truth, and so it is with epidemiologists. I remember once working with a lawyer, and he said to me, "Alex, epidemiologists are the most naïve people in the world." I guess that's true, but it comes of, I think, a commitment to social justice. A feeling that it's important to be fair. It's important to be accountable and transparent, and I find it unacceptable that we cover up things that the public deserves to know. Ray: That was Professor Alex Barratt. Thanks to Jan Muths for editing, Shauna Hurley and Cochrane Australia for production and the BMJ for co-publishing. And if you like The Recommended Dose, please recommend it to others.